Last weekend, I bought a 6-pack of Guinness stout to make this Guinness Brown Sugar Glazed Corned Beef. 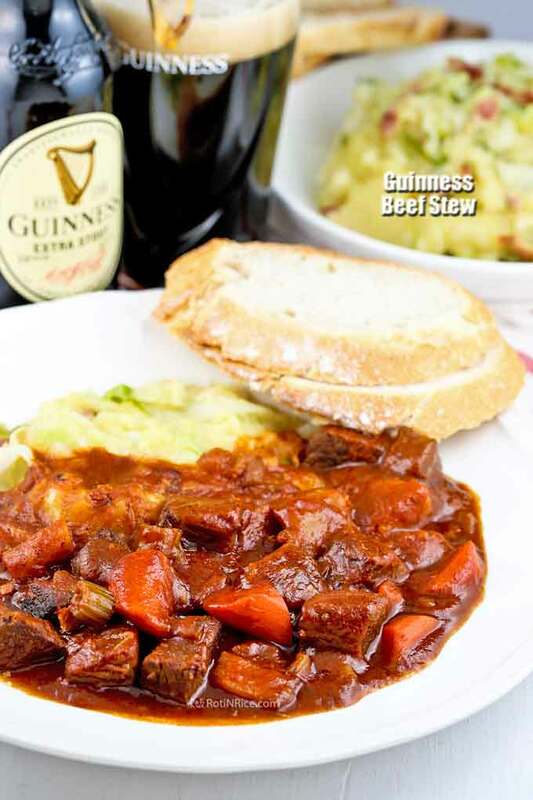 With 5 bottles left, I have decided to use it for yet another recipe and this time it is this rich and robust Guinness Beef Stew. I am glad I did because this stew is super yummy and comforting served with mashed potatoes on a cold day. You do not need an expensive cut of beef to cook this stew. Both chuck roast or bottom round roast would work. The chuck comes from the shoulder portion of the cow while the rump or round comes from the cow’s hindquarters. 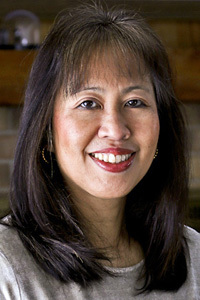 Of the two, the round is leaner and more tender. Chuck roast contains more fat. In this recipe, I used bottom round roast simply because it was on sale. Since there is bacon in the stew, a leaner cut works just fine. 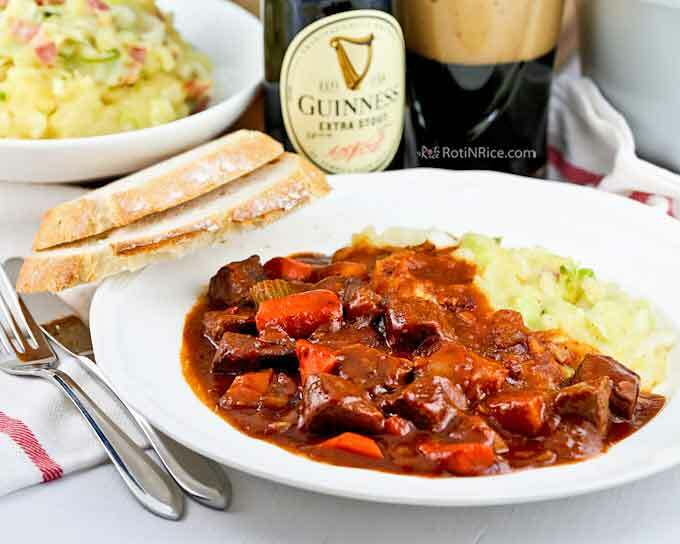 This delicious Guinness Beef Stew is delicious served with Colcannon. I cooked this tasty Irish Mashed Potatoes with Cabbage while the stew was simmering on the side. There is more than enough time and some to spare to cook this Irish mashed potatoes. If you don’t want the hassle, then just get a loaf of crusty bread from the grocery store. Either way, it will be delicious! 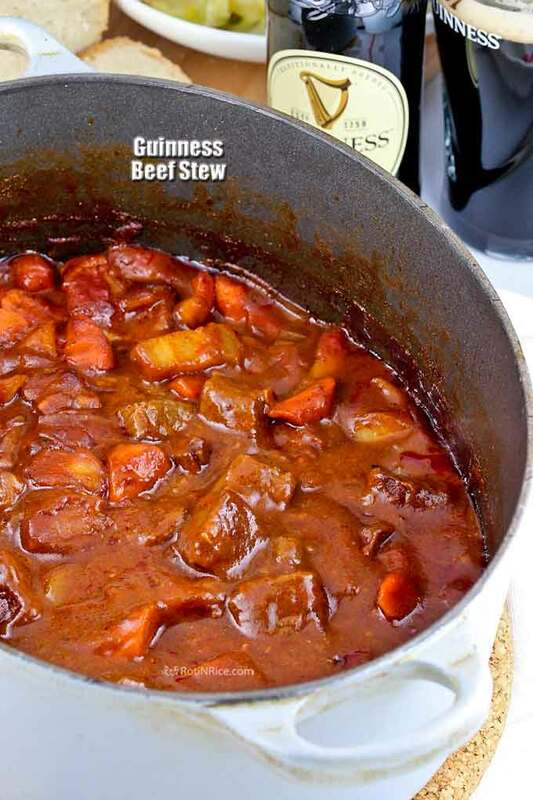 This Guinness Beef Stew recipe was adapted from Allrecipes. Heat a large dutch oven. Fry bacon for about 5 minutes. Remove and set aside leaving the fat in the dutch oven. Sear beef in 2 batches, about 3 to 4 minutes each batch. Remove and set aside. Add vegetable oil to the dutch oven. Saute onions for 2 minutes. Then add garlic, celery, carrots, rosemary, and thyme. Saute for 1 minute. Stir in all-purpose flour and continue to cook for another 2 minutes. Add tomato paste and Guinness stout. Stir to mix. Return the beef and bacon to the dutch oven. Also add the parsnips. Stir to get everything well mix. Reduce heat to medium low and simmer for 1½ hours stirring occasionally. Add salt and ground pepper after 1 hour. 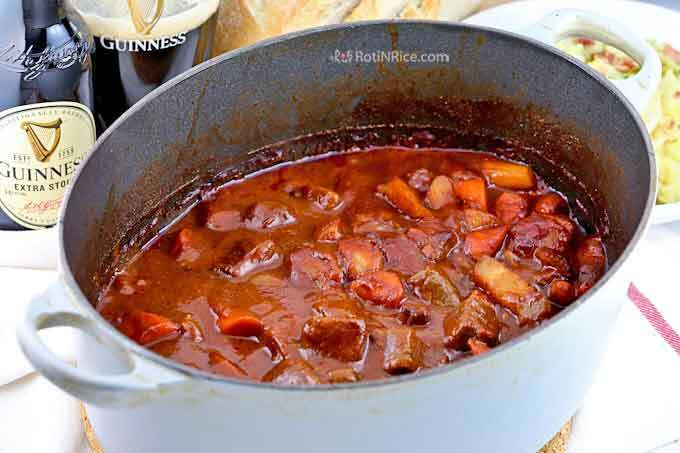 You can swap out the parsnips with potatoes if you plan on serving this Guinness Beef Stew with crusty bread or have a little of both. This is my first time using parsnips and I do like it. They have an earthy taste and are more starchy than carrots but less so than potatoes.